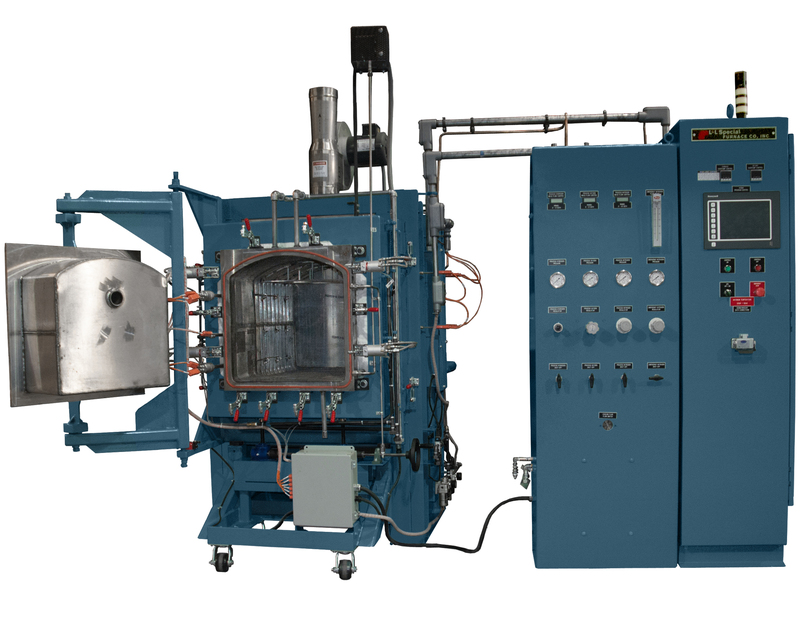 Electrical Box Retort Furnace for Annealing Motor Laminations in Hydrogen - L&L Special Furnace Co, Inc.
L&L Special Furnace Co., Inc. has shipped a retort furnace to a northeastern US manufacturer of motor laminations. The laminations are deployed on motors, primarily for government-based aerospace products. Annealing of silicon iron and similar laminations are treated in a pure dry hydrogen atmosphere. A pure dry hydrogen atmosphere is provided to balance strength and magnetics in these laminations. There is also an oxidization process that can provide a thin oxide coating layer for improved durability and resistance. The furnace has a work zone of 17” square. The typical load weight is 250 pounds. The retort is removable to achieve the required aggressive cooldown curves. The furnace is built in accordance with ASTM standards. All thermal data is collected and stored from each run through the PLC-based control system. The XLC246 was set up to perform both hardening and oxidation during a single heating cycle. To accomplish this, L&L outfitted the furnace with a custom-developed Honeywell control system. The control system utilizes both the Honeywell HC900 Hybrid Controller and 900CS10 Touch Screen Operator Interface. The HC900 employs four cascading PID Loops to control four banks of heating elements using time-proportional solid-state relays. The hydrogen, oxygen and nitrogen gas control is accomplished using three PID loops to control three mass flow gas controllers. The use of mass flow controllers allows the furnace operator to program specific flow rates for each separate segment of the heating profile. As with all furnace control systems, L&L takes extra precaution to ensure that the system is safe to operate. NFPA86-compliant interlocks are in place for both the hydrogen and oxygen lines to ensure that the furnace is in a safe state before introducing either gas into the system. There is a mechanical interlock that prevents oxygen and hydrogen from being introduced at the same time. Furnace purge is done with NFPA-compliant timed purge to ensure that a tested and verified amount of nitrogen is run through the furnace before any combustibles are introduced. All of L&L’s furnaces can be configured with various options and be specifically tailored to meet your thermal needs. We also offer furnaces equipped with pyrometry packages to meet ASM2750E and soon to be certified MedaCred guidelines.